This column appears in the Oct. 28 issue of The New York Times Magazine. “They also focused on aerobic training to lower body fat.” <<<—– Well that’s your first problem! …And what kind of experimental group is only made up of 17 people? 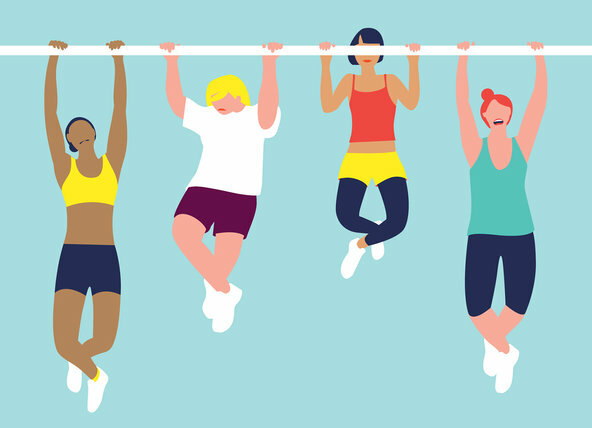 “By the end of the training program, the women had increased their upper-body strength by 36 percent.” <<<—– What exercises were used to determine an increase in strength gains if the goal of the test was to increase number of pull-ups? Note: 23 percent of the group increased their pullup number by 100%. “Men and women who can do them tend to have a combination of strength, low body fat and shorter stature.” <<<—– So tall people with long limbs have trouble doing pullups? C’mon! More women are of “shorter stature”…. So, according to this, they should be well equipped for performing pullups. Way to go, New York Times! Get people that know what they are talking about to conduct “fitness” research!